Drupwn claims to provide an efficient way to gather drupal information. 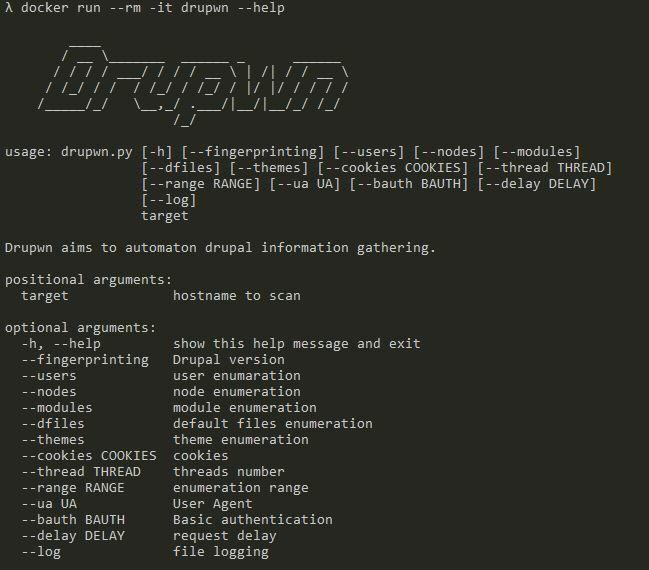 Drupwn can be run, using two seperate modes which are enum and exploit. The enum mode allows performing enumerations whereas the exploit mode allows checking and exploiting CVEs. docker build -t drupwn . To add a new module, follow the template used in the User.py file. Then, add a reference in the Parser as well as in the Dispatcher in order to ensure its support by the reflective factory. Drupwn is provided under this License on an "as is" basis, without warranty of any kind, either expressed, implied, or statutory, including, without limitation, warranties that the Drupwn is free of defects, merchantable, fit for a particular purpose or non-infringing. Running Drupwn against websites without prior mutual consent may be illegal in your country. The ImmunIT Team accept no liability and are not responsible for any misuse or damage caused by Drupwn.